"You’ve been given a unique opportunity to become a head of the magnificent city of Urbis. There is always a plenty of those who are eager to take this place, so when such a chance comes up, they’re ready to take it by all means. The city of Urbis is ruled by the City Council elected by the residents. The main objective of the game is to become the Head of the Council. Like all the other players, you are a Council member who is responsible for the well-being and prosperity of the city. Each Council member (player) has an access to the city treasury and guard, and is obliged to follow the Council’s decrees. Each councilor is in charge of one of the city blocks (represented by a board given to each player in the beginning of the game) and aspires to develop his block either quickly or proficiently. Gold and silver from the treasury are distributed depending on the buildings that have been put up on the block. However the block residents are always on the lookout: no one wants to live close to the cemetery, gibbet or prison. Take thought for the residents, spend some money, and these grim buildings will appear on the neighbor's block instead of your own. Hospital is also an essential city institution but it demands substantial charges to maintain. Taking this into account a player might awaken his inner dictator and build up his block with slums and honky-tonks, regardless of the residents’ needs, because the first player to fill all the building slots on his block becomes a winner. Which way is the best? To consider the block residents or to just execute the will of the Council? To turn your block into a dark place or a blooming garden? In Urbis you’ll have to make decisions promptly." 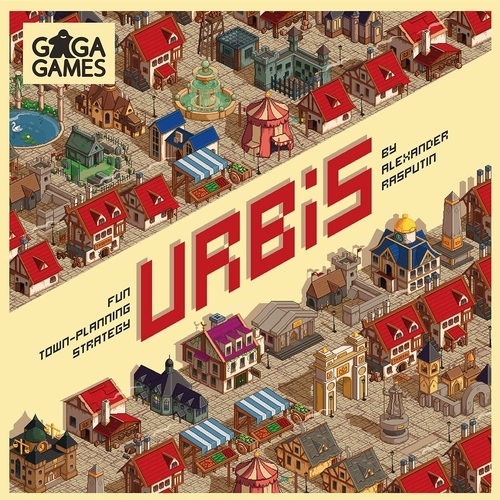 To set up Urbis each player takes a city board and places it in front of them on either the easy side or the experienced side. Players then take 5 silver coins and an income marker to place on the income track on their board. Extra silver and gold coins are placed in the center of the table along with the guard tokens. The building tiles are then shuffled and placed in the center of the table as well—the number of tiles used depends on the number of players. Lastly shuffle the decree cards and extra building lots together dealing three cards to each player and placing the deck face down in the center of the table. That is it, pretty simple. Players continue to take turns in a clockwise direction until the end game condition is triggered. Player 1 filled her block and won. As you can see from the above description of the rules, the game is very simple to set up and to play. The genius of the game is in the choices you make as you are placing buildings and playing decree cards to build up your block of the city and keeping others from building up theirs. 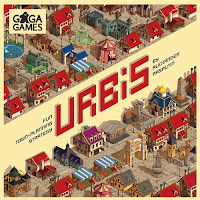 City building is my favorite theme and this game is all about building up your little part of the great city of Urbis. The decree cards continue this feeling as you are carrying out the orders of the city counsel. The mechanics of Urbis are straight forward and simple. You are choosing one of four actions and reacting to their outcomes. The real game play here is choosing what to do with the decree cards in your hand and the buildings you draw. Decree cards can effect you or your opponents (or both) so you must play them wisely. Being able to place buildings in your opponents city block is a two edge sword as you can be either helping complete their block quicker or you could be hurting them with negative victory points or income. The components are solid. The artwork for the building tiles are fun and reminiscent of games like Sim City. The artwork and layout of the cards leave a little to be desired but are functional. 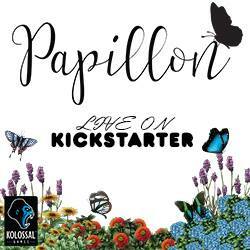 The player boards are sturdy and serve their purpose and the tokens are also good quality. The theme is the big seller for me on this one—I love to build cities! As I said above the artwork on the building tiles is great and game play is very simple. Part of the strategy of this game is keeping your opponents from completing their blocks or from scoring more points than you and as a result there is a lot of "take that" in this game. For some this won't be an issue, but my gaming group does not like this style of play. The other thing missing for me is building powers. I would have liked to see the building have unique attributes that gave the players new abilities once placed in their blocks. I like Urbis. It is quick to learn and easy to play, however I wish it had less "take that". I am giving it 3 out of 5 super meeples.